Below is a list of our favorite gadgets and gizmos that make RV life much easier. Some of these items we had right from the start, others we discovered we needed as time went on, and some we wish we had from the very start. What would we do without this? We’d be going to the store every 4 weeks to replace our glass french press. After breaking 3 glass french presses we decided something had to change. 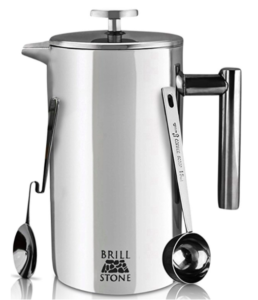 A friend suggested this stainless steel french press. It has been a godsend! We also recently discovered this vacuum insulated model that we just might be upgrading to soon. We are super thankful we got into solar! The money we spent on this panel and two 6 volt batteries paid for itself in our fist trip. Staying off grid saves you lots of campsite fees. Plus the campsites you get to stay in when you are boondocking beat any RV park. Investing in a simple solar setup will allow you to stay in more places, and have loads more experiences. 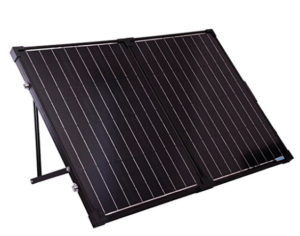 See my blog post about our solar setup for more information! You might be thinking, why this hose? It’s just a simple water hose. Well, we this is one of those items we went thorough several hoses before realizing it was best to invest in quality. 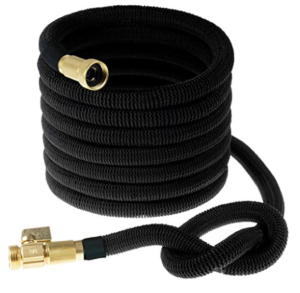 This is the hose we use for watering our plants, washing the RV, and flushing out the black tank (you don’t want to use your fresh water hose for that). This hose is amazingly easy to handle, doesn’t kink, turn or twist. And it coils up easily for storage. All the other hoses broke, cracked, twisted, and were a pain to deal with. This hose was well worth the investment. Ok, TRUST me on this one. It’s worth the investment, unless you don’t mind cracked hoses and poop leaking all over your hands. If your cool with that just buy the cheap hoses. 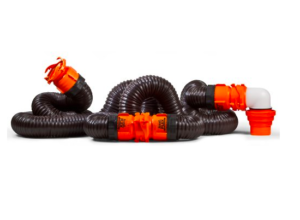 Seriously, we had at least two different brand of hoses before landing on the Camco Rhino Flex hoses. These are super easy to use, and allows you to easily connect two hoses for those rare times you are far away from the sewer connection. Dumping your black tanks is a pretty crappy job, but you might as well be as clean as possible while doing it. We went our first couple years without a dehumidifier, but for some reason in our new RV the condensation buildup during the winter was just out of control. It was so bad that there would be seams in the inside of the RV with streaks of water. Mold was even beginning to grow on the windows. So, we invested in one of these bad boys. We bought a temperature and humidity monitor at the same time as well, and saw a pretty dramatic decrease in the humidity level after it had been running for only a couple hours. 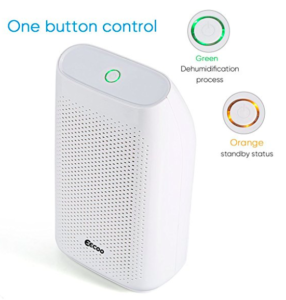 There also products like Damp-Rid that help remove humidity from the air as well. We also learned that controlling the humidity in the RV is crucial so you don’t start having a big mold problem – case in point…the mold that started growing on the windows. Space is limited in an RV, so we avoided getting a printer for the longest time, until Kristy started working again doing her home based business. 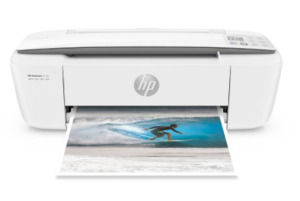 At this point we pretty much had to get a printer, so finding one with a small footprint was critical. This was the best option we found, and there were several color options. Ours actually matches our curtains! 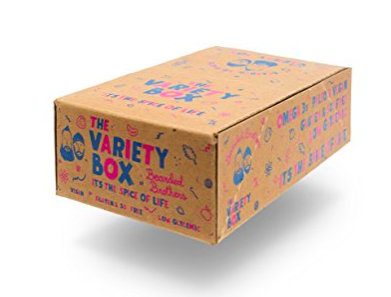 With this affiliate link purchase you also support our small family owned business, Bearded Brothers! Caleb’s full time job is making delicious USDA Organic Energy Bars. The bars are paleo, vegan, gluten free, soy free, and most important…they taste amazing. We started this little company in 2011, and we have been holding our own against some of the big dogs in the industry ever since. Created for adventure, made in small batches, and family owned. Kristy and I have always been healthy minded since we got married, and this is one of the few things from our apartment that made it into the RV. 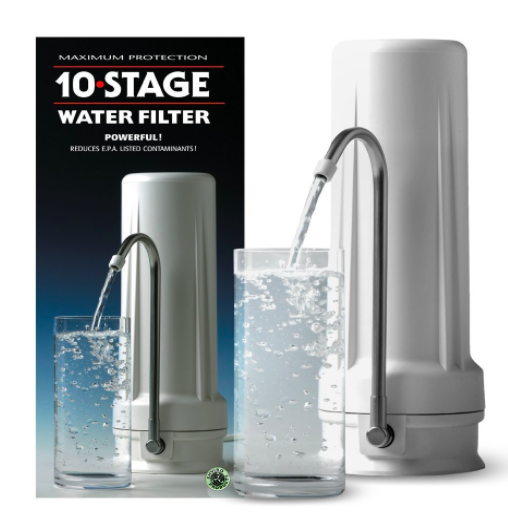 Water quality is very important to us, and this countertop water filter is perfect for the RV. Way better than space hogging water filters like the Berkey. Initial cost is about $70, and annual filter replacement cost is $50. Speaking of water and the RV lifestyle. NEVER drink water from your RV fresh tank! The instructions that come with your RV are downright scary. If you bought your RV used you have probably never seen the warnings about sanitizing your tank before using it. So, knowing that, we always bring bottled water when we boondock. We only use water from the fresh tank for dishes, quick showers, and washing hands. Consider this a growing list! We will continue to add to it. As of February 4th, 2018 we just started taking this blog seriously. So be looking back for some great content.